A few weeks ago Kim reached out to say she'd found the dresser she'd been looking for on Curating Craigslist. I'm always excited to find out the site helped someone and the excitement almost doubles when it's a project piece. As you can see from the picture this was definitely a project. I was delighted to hear that she'd completed the project this week. She sent me a picture and I had to share. Kim transformed this old $60 dresser into a stunning new piece using 2 different shades of chalk paint. I'd love to make this a regular feature on the site. If you've found a project piece on Curating Craigslist please let me know. Who knows, maybe it'll end up here. Kim's dresser deal when she brought it home. Posted on July 2, 2014 by Megan . Mirrors can be a great addition to your home decor. Not only can they fill up space on a wall but they reflect light and can make your room feel brighter and larger. Here are some great mirrors I saw this weekend and a few ideas on how to make them work in your space. Check out my mirrors board on Pinterest. Here are some ideas of what you could do with this vintage pair of mirrors. I love the style of this antique full length pagoda mirror and at $225 I think its a pretty good deal. Similar mirrors from high end designers range anywhere from $500-$1000. I think the gold is beautiful but I really like the way these mirrors look painted - I think the key to achieving this look would be a high gloss paint, I’d use spray paint, just be sure to tape up the mirror really good to avoid getting paint on it. 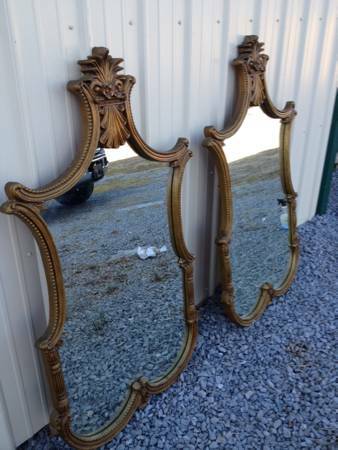 This mirror doesn’t strike me at first glance but it has unique geometric beveling and is a great size for over a dresser, buffet, mantle, or even a couch. If the frame was painted white, gray, black or even a fun color it would be a great affordable option for that wall in your house you just don't know what to do with. 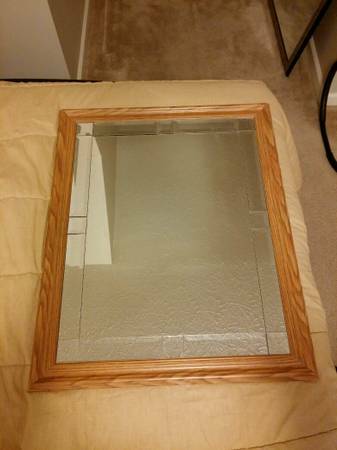 At $5 this mirror is a steal! Posted on February 23, 2014 by Megan .